BSNL Penta Tpad IS 701r tablet for students will be a real competitor for Aakash tablet. Aakash tablet competitors are now on line giving a touch competition to the cheapest tablet in the world. Just a couple of days after the official launch of BSNL Penta Tpad IS 701r tablet which is priced at Rs 3,250, tablet fans are flocking in to the website of Pantel for to pre book the tablet which is tagged at a dream price. BSNL(Bharat Sanchar Nigam Limited), one of the leading telecom operators in India joining hands with Pantel, a Noida based company has introduced 3 tablet PCs in for the Indian customers. Among the three, BSNL Penta Tpad IS 701r tablet priced at Rs 3,250 is good for those who are looking for a tablet at an affordable price. The most interesting fact is that the Penta Tpad IS 701r tablet has been launched at the right moment while customers who have booked Aakash and Ubislate Plus are patiently counting on the days for its delivery. Priced at Rs 3,250, BSNL Penta Tpad IS 701r tablet would be more ideal for school and college students who want a device for easy usage. Most excitingly BSNL put forward a special launch offer. By paying an additional Rs 249(3,499), the customer will get a BSNL 2G SIM and a special Penta Data plan of free data download for 3 months. Here is a quick look on the specifications of BSNL Penta Tpad IS 701r tablet. So looking at the specifications and features of Penta Tpad IS 701r which come at a price of Rs 3,250 is far better than Aakash tablet which is priced at 2,500. Penta Tpad IS 701r tablet comes with 1 year warranty. If you are a customer interested in booking the Penta Tpad IS 701r tablet with BSNL data plans, do visit the official website of Pantel. You have to fill up the pre booking form with details. 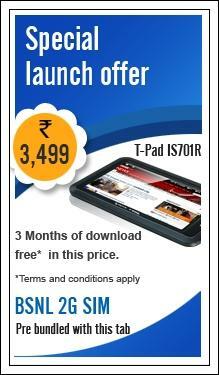 So if interested do pre order or buy BSNL Penta Tpad IS 701r Tablet online from the official website. This article is about the new combination of the tablet PC with GSM calling function. This article includes three tablets from different manufacturer, price with their key features and specification. In this article, you will find BSNL tablet PC detail here. Pantel Tablet computer manufacturer has signed with BSNL on different product Tablet PCs. Penta Tpad IS 701r Tablet is the low cost tablet from BSNL, they are about to release three different range Tablet PCs for different price. Find BSNL Tablet PCs detail and price list. Find detail on BSNL Penta Tpad IS 701r tablet, BSNL Penta Tpad_ws704c tablet and BSNL Tpad WS802C tablet PCs. This article is about Cheapest Bsnl Penta Tpad IS 701r tablet. Bsnl Penta Tpad IS 701r tablet features, specifications and price are out in market. If we compare Aakash tablet features, specifications and price with Bsnl Penta Tpad IS 701r tablet then customer reviews goes with Bsnl tablet. Read this article to know Cheapest Bsnl Penta Tpad IS 701r tablet features, specifications and price in India. Bsnl Penta Tpad tablets are out in market. Bsnl Penta Tpad tablets online booking and pre-order started in India. Cheapest Bsnl Penta Tpad IS 701r tablet online booking, buy and pre-order at available at price of Rs 3250. Bsnl Penta Tpad IS 701r tablet official features, specifications and price are given below. Read this article to know how to pre-order Bsnl Penta Tpad tablets in India. This articles is about how to book bsnl tablet online or through phone. You can book BSNL tablet only through online or Phone only. The manufacturing company Pantel Technologies will start shipping the pre-booked bsnl tablets by march 5.